Reporting on intelligence activities is notoriously difficult and often relies on off-the-record sources. I used only on-the-record sources such as: a detailed interview with the retired FBI agent who was Aoki’s handler, interviews with Aoki, FBI records concerning Aoki obtained under the Freedom of Information Act, consultation with another former FBI agent to interpret the records and research in other records on Aoki and other informants. Fujino claims that “the entirety of Rosenfeld’s evidence relies on FBI sources” and asks if we are simply to trust authority figures. She surely knows that former FBI agent M. Wesley Swearingen, who concluded in a sworn declaration that Aoki had been an informant, helped vacate the murder conviction of Black Panther Geronimo Pratt on the grounds that the FBI and Los Angeles police failed to reveal that a key witness was an FBI informant. Fujino has acknowledged she had obtained the same “T-2” FBI document about Aoki as I had but consulted no experts. 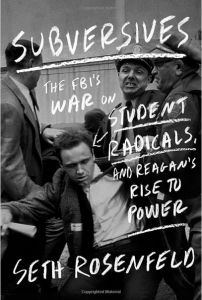 She asks, “How did (Aoki) help the FBI disrupt political movements?” I never said he did. Likewise, Fujino suggests I am putting a “snitch jacket” on Aoki — framing him as an informant — yet she offers no evidence for this false charge. Fujino presents herself as an objective scholar, but she is a competing author with a vested interest. She has done a disservice to the pursuit of truth.